Finally sent over some art/words I've been putting off...! The tip jar at work today produced some FAT stacks of cash. My roommate and I had work at the same time today, so we carpooled and listened to the news. It was cute. Went out and bowled with (internet) friends! EDIT: one week of WDYDT? It's a lazy monday for me too! Slack-off time is always good when you plan for it. But I think the most important thing I did was ask mom about health insurance. I now have a list of doctors to call about my possible depression. I don't think I've seen a doctor since before I've moved out. Any amount of progress is a good thing. If we are determined, we will get to where we want to be, even if it takes a very, very long time. Yesterday I worked some more on my Lego Saturn V set, practiced violin for the first time in a while, and went to the gym. I took pride in my work at Pita Pit today. I learned a lot about one of my newer coworkers. 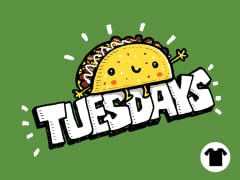 It's Tuesday, so I get to wear my Taco Tuesday shirt. Got more stuff done that was on my backlog, yoya! Recommended some music a friend really enjoyed! I scheduled my doctor's appointment next month! I left work less than 15 minutes after closing, which is rare! I drew a fabulous dragonair. Been listening to a lot of OK Computer recently.... am I becoming emo again?? Is this it??? didn't get as much done as i would have liked to (wanted to finally start on the programming that i've been meaning to work on ever since i came back from england, wanted to complete the LOM update instead of just starting it) but it's a start. i'm not sure i'm ever going to be able to get as much done as i want this summer -- it's consistently 90 degrees outside, and i have to choose between a dark, shut-up, but-still-hot-ish house or a hotter-than-outside greenhouse, and i find it hard to focus in either one. i just wanna be laaaaaazzzyyy and i hate it! That sounds like a good day. A born day! Hope it was a good one. I slept in also, it was good. I really like how today's Cherry Bomb turned out, didn't need to write anything - just draw. After that, I had some much needed relaxation time. yesterday i made spaghetti, which turned out very well, worked a bit on programming and LAND OF MEDIEVALTONIA, and went to bed early. Did NOT get born, but went out with friends and had cake regardless! Got a manned ship in orbit around the Mun and back to Kerbin, then installed a comms relay in high Munar orbit. Will do a landing as soon as I have enough science to get decent struts. Almost finished LAND OF MEDIEVALTONIA (as in, I was literally right about to hit post two minutes ago), but I had great ideas for two gag panels and I'll have it finished by tomorrow I promise. Looking at mars is really cool! I like seeing it in slightly different spots at different times of night. I went to 7-11 four times today. Made a bit of a tasteless joke, but I learned from it! Why is Mr. Brightside so good? ?